NRGH 2017 - [2017-10-30. 이준행 comment] 위암 예방을 위하여 population 기반의 H. pylori 제균치료를 해야 한다는 것은 이제는 상식에 속한 일입니다. 정부 정책으로 사업을 하지 못할 망정 엉뚱한 기준을 들이대서 삭감 위협을 하는 것은 어이없는 일입니다. 제균치료가 필요하다고 의료진이 판단한 환자에 대하여 제균치료를 할 수 있도록 제도적 보완을 해야 할 것입니다. 최근 상부위장관헬리코박터학회지에 건국대 이선영 교수님께서 '위암화 과정에서 발생하는 세균총의 변화'라는 멋진 종설을 발표하셨습니다. 축하합니다. 위암을 공부하는 분들께 일독을 권합니다. 제가 가장 관심있게 본 내용은 아래 그림입니다. 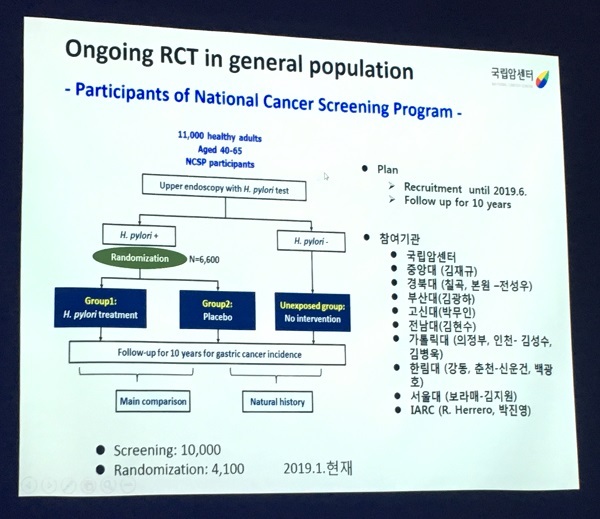 헬리코박터는 위의 pH가 낮으면 (=산성 환경) 빠른 carcinogenesis가, 위의 pH가 높으면 느린 carcinogenesis가 일어난다는 것입니다. 헬리코박터 감염이 일어나더라도 위의 pH가 낮으면 (=산성 환경), 위내 세균은 대부분 헬리코박터입니다. 헬리코박터 이외의 세균에서는 산성 환경에서 생존할 수 있을 만큼의 다량의 urease를 보유한 균이 없기 때문입니다. 이러한 환경에 빠른 속도로 암이 진행하여 젊은 환자에서의 미분화 조직형 위암이 발생됩니다. MSI는 드물고, PET uptake가 되지 않는 형태입니다. 젊은 여성에서 자주 발견되는 미분화 조직형 위암의 발생기전입니다. 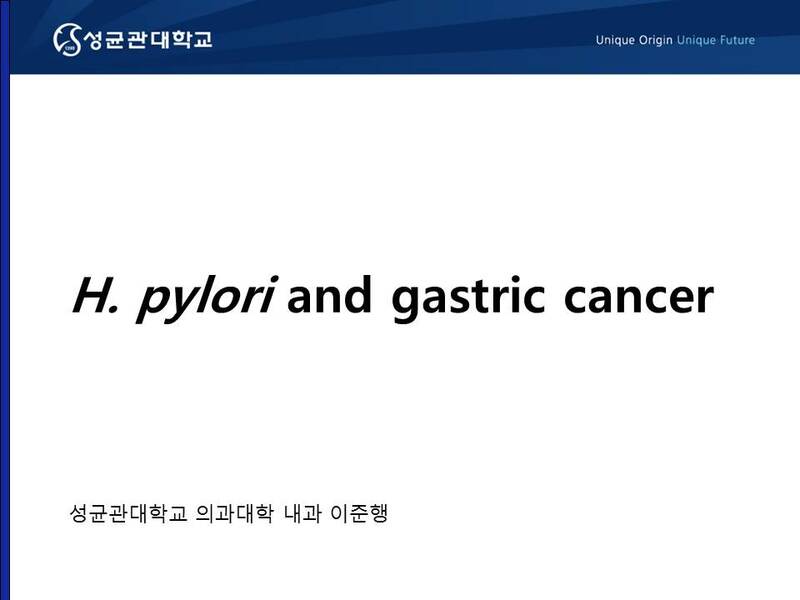 젊은 여성의 Borrmann type IV나 lymphofollicular gastritis와 관련된 위암이 이러한 기전으로 인한 것이 아닌가 생각됩니다. 현재보다 훨씬 젊은 나이에 헬리코박터를 검사하여 제균치료를 해 주어야 하는 이유입니다. 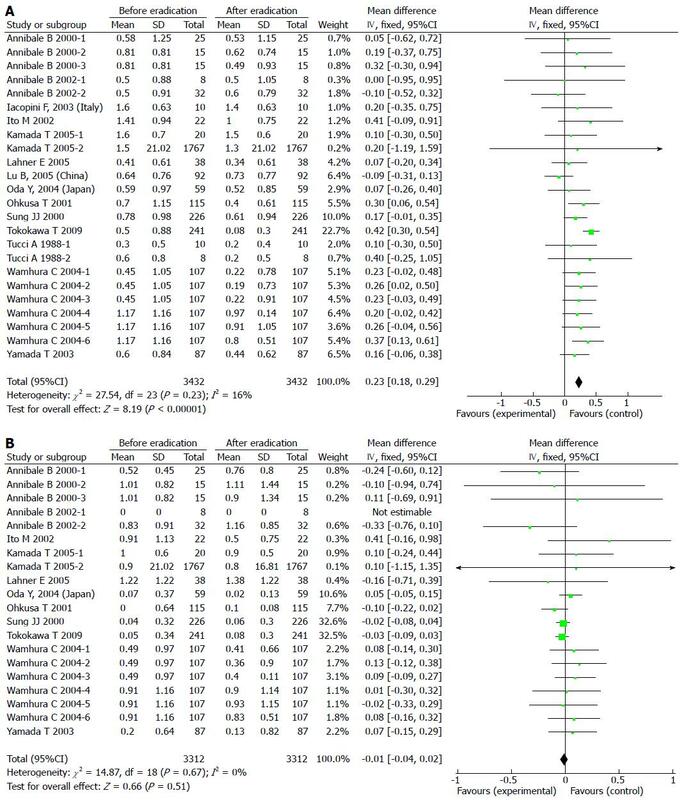 헬리코박터 제균치료에 대한 세계적인 연구(NEJM 2018)를 발표하신 최일주 교수님의 강의가 있었습니다. 이런 내용은 저자 직강이 딱입니다. 위암 환자의 헬리코박터 치료에 대한 각국의 가이드라인입니다. 내시경치료 후에는 대부분 헬리코박터 제균치료를 권하고 있으나 수술 후 치료를 권하고 있는 곳은 많지 않습니다. 제균치료는 암 발생률을 의미있게 감소시켰습니다. Hp 제균치료 자체가 암 발생을 줄였는지 혹은 항생제 사용이 암 발생을 줄였는지에 대한 논의가 있습니다. 현재의 자료는 항생제 사용이 아니라 Hp 제균 자체가 암발생을 줄인 것을 보여주고 있습니다. 또 다른 primary outcome인 atrophy와 metaplasia의 변화입니다. 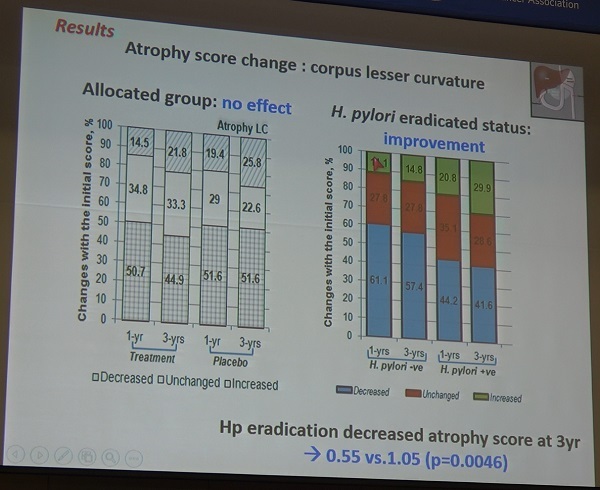 제균치료 후 atrophy와 metaplasia가 의미있게 호전되었습니다. 비록 재발률의 차이는 없었으나 Hp 제균치료는 surrogate marker인 atrophy score를 호전시켰습니다. 최일주 교수님의 멋진 결론입니다. 이런 큰 주제에 대한 강의를 오로지 본인의 연구 자료만으로 결론까지 이끌 수 있다는 것은 놀라운 일입니다. 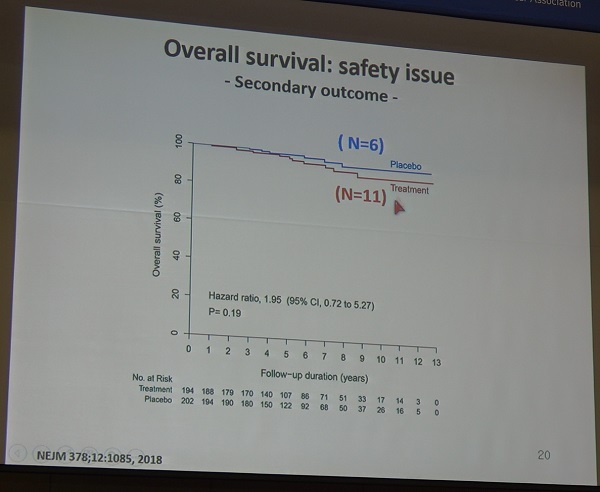 최일주 교수님께서는 2019년 1월 26일 헬리코박터학회 부산경남지회 심포지엄에서도 비슷한 슬라이드를 보여주신 바 있습니다. 멋진 요약입니다. 최일주 교수님의 또 다른 멋진 연구가 곧 발표될 것 같습니다. 이미 enrollment와 followup이 끝났고 분석 중이므로 조만간 결과를 발표할 수 있을 것 같다고 합니다. 15년 전에 시작하여 지금까지 계속되고 있는 대단한 project입니다. 최일주 교수님의 또 다른 연구도 기대됩니다. General population에서 Helicobacter 제균치료의 효과를 보기 위한 다기간 RCT가 진행되고 있으며 현재 환자 enrollment 중이라고 합니다. "대단합니다"를 반복하여 외칠 수 밖에 없습니다. 존경합니다. Toshiro Sugiyama (Toyama University) 선생님의 특강이 있었습니다. 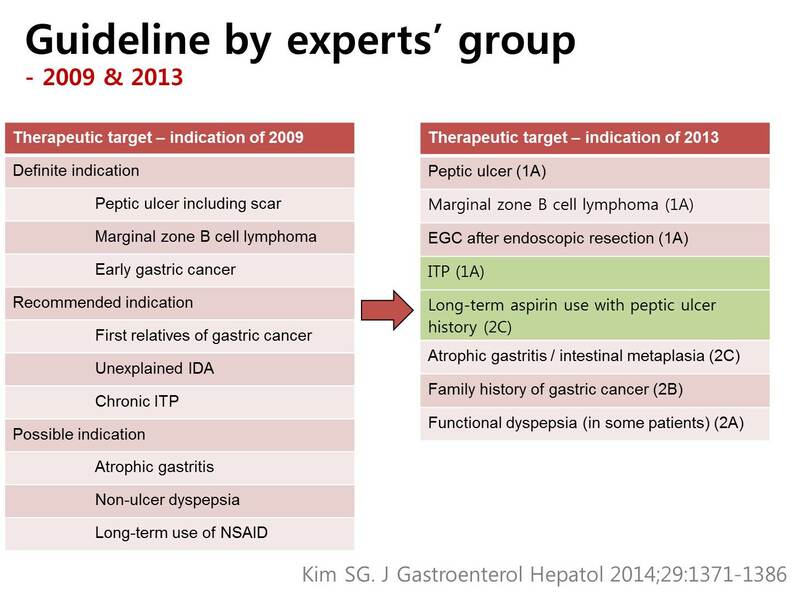 제목은 "A new strategy for prevention of gastric cancer and the related issues in Japan"이었습니다. 요약합니다. "일본의 여러 연구를 종합하면 Hp감염자는 75세까지 생존시 8%에서 위암이 발생합니다. 제균치료가 위암을 상당부분 막을 수 있다는 연구 결과도 많습니다. 이러한 자료를 바탕으로 일본 정부는 2013년 2월 Hp 제균치료의 범위를 Hp 양성 위염까지 넓혔습니다 (All infected persons were permitted to be eradicated under government health care system). 일본 정부에서는 두 가지 제한을 걸었습니다. ABC screening으로 risk strafication을 하고 그에 따라 screening 간격을 정할 수 있습니다. ABC screening으로 위암발생률을 예측할 수 있기 때문입니다. ABC 그룹에 따른 위암 발생률은 A: 0%, B: 0.11%, C: 0.24%, D: 1.31% 입니다. 40세 이상 일본인 대상 연구에 의하면 ABC screening에서 A가 61.0%를 차지하고 있습니다 (B는 5.4%, C는 26.1%, D는 7.4%). A에 해당하는 사람은 screening을 하지 않는다고 하면 cost-effectiveness는 매우 좋아집니다. 이러한 노력을 통하여 일본의사들은 위암사망률을 10년 후까지 78%가량 줄일 수 있기를 기대하고 있습니다." ABC screening와 관련된 내용을 다시 정리하면 아래와 같습니다. 여기서 내시경 간격은 제균치료를 시행하고 제균이 되었음을 확인한 후의 간격을 말하는 것입니다 (위의 강의 화면 참조). 일본 정부에서는 "제균치료를 허용한다"까지만 정해놓은 것 같습니다. ABC screening에 따른 검사간격 조정 등은 아직 일본 학계에서 논의되는 정도입니다. 일본에서 위내시경은 13,000엔인 모양입니다. 우리 돈으로는 약 14만원. 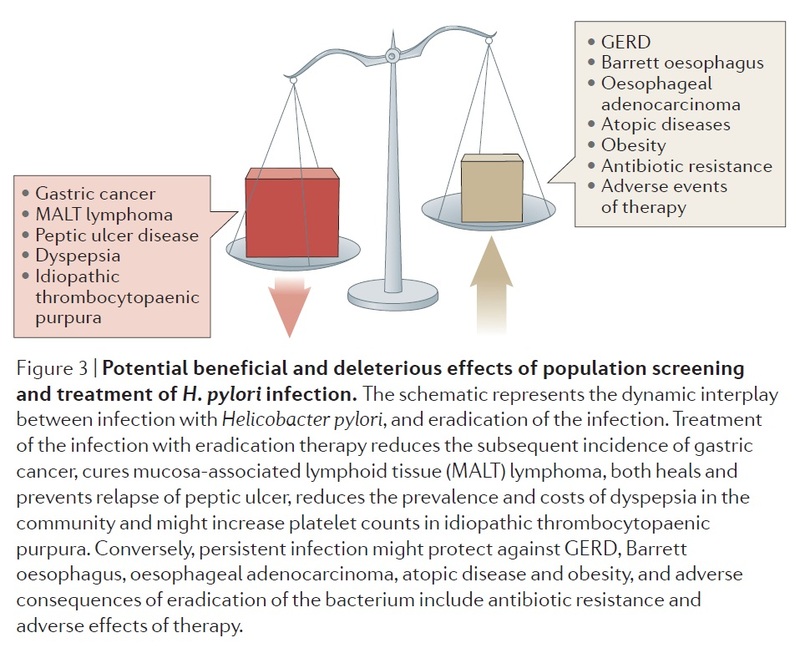 The bacteria-metaplasia cancer link gets even more complicated when H. pylori is viewed as a contributing member of society, rather than a hermit. The bacterium seems to be a bully in the neighborhood, radically altering the normal gastric microbiome, Dr. Peek said. 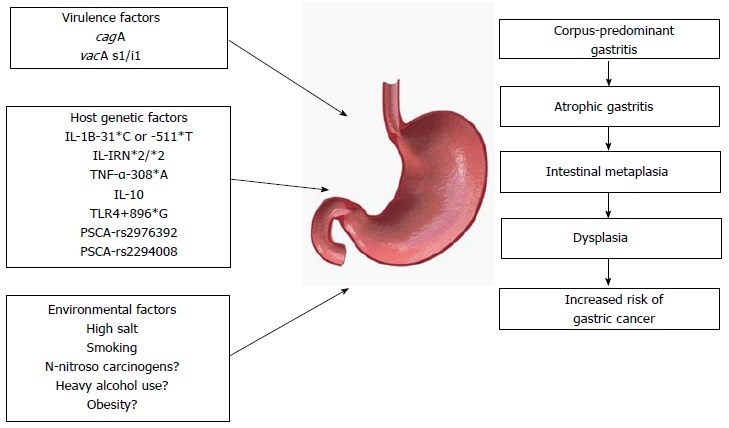 In the absence of H. pylori, the gastric microbiome is much more diverse, consisting of about 50% Actinobacteria and 25% Firmicutes species. Bacteroides and Proteobacteria species make up the remainder, with a small population of Cyanobacteria as well. In its presence, Proteobacteria - a gram-negative genus that includes a wide variety of pathogens - almost completely subsume beneficial bacteria. 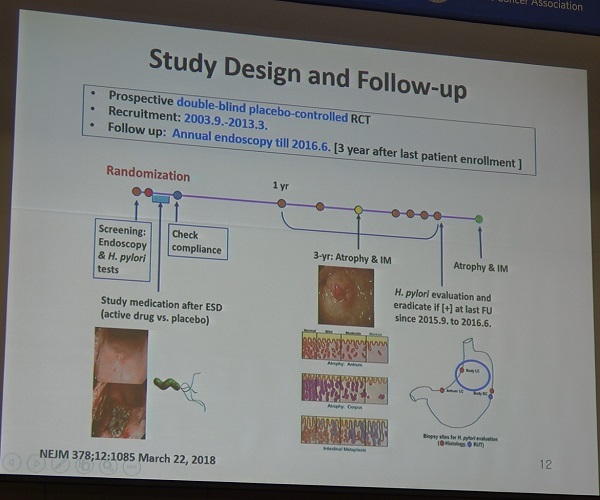 Researchers saw this change in action in 2011, when a group at the Massachusetts Institute of Technology, Cambridge, inoculated two mouse populations with H. pylori and followed them for gastric neoplasms (Lofgren JL. Gastroenterology 2011). All the mice were genetically engineered to overexpress human gastrin, a characteristic that invariably leads them to develop gastric cancers. One group comprised germ-free mice raised in sterile environments. The control group was free of pathogens, but lived in a conventional environment and so had normal gastric flora. Both groups were inoculated with H. pylori. By 11 months, the microbiome of the control group was strikingly different. It showed a significant increase in the number of Firmicutes bacteria in the stomach, with an associated decrease in the number and variety of other bacteria including Bacteroides. 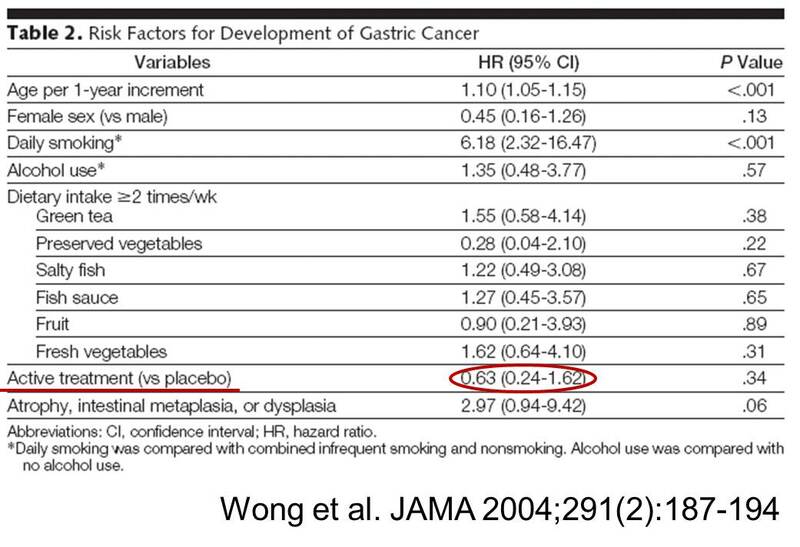 This was especially interesting when viewed in relation to the rate of gastric neoplasia, Dr. Peek said. These mice are programmed to develop gastric cancer by 6 months of age - and this is what happened in the control mice, which had H. pylori plus other gastric microbes. But the germ-free mice who were monoinfected with H. pylori showed a much different progression of disease. At 7 months, most showed only a mild hypergastrinemia. Conversely, at 7 months, all of the H. pylori-infected control mice had developed gastric intraepithelial neoplasia, 80% of it high grade. Only 10% of the monoinfected mice developed cancer, and all of it was low grade. 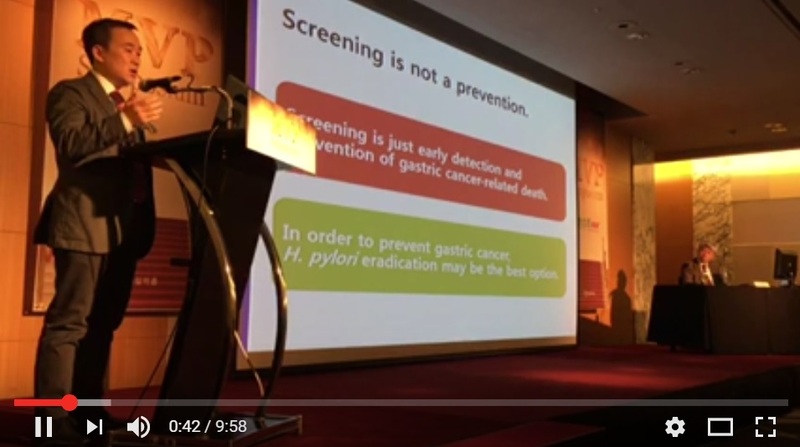 Abstract: Until recently gastric cancer was the most common cause of cancer deaths in the world. 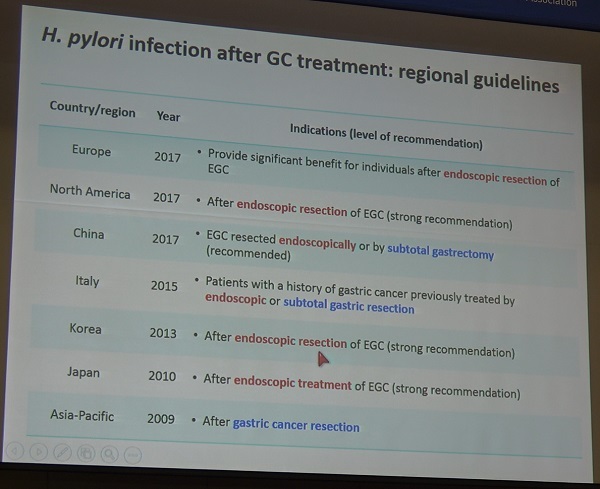 The discovery that gastric cancers were etiologically related to infection with H. pylori led to the realization that H. pylori eradication would prevent most gastric cancers. 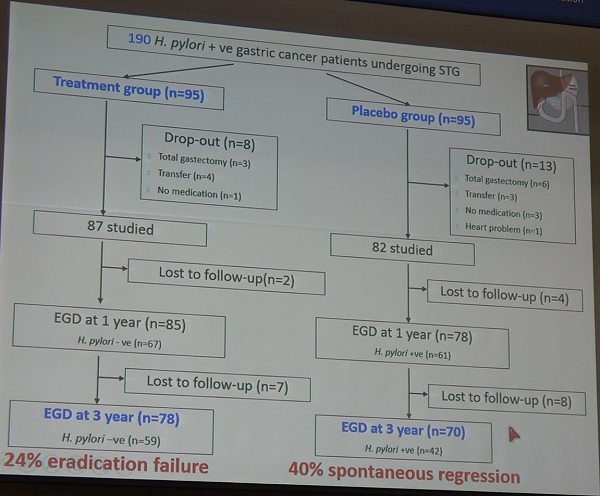 Gastric cancer is an inflammation-associated cancer with H. pylori infection being the cause of ongoing inflammation, rapid cell turnover and production of tissue damaging reactive oxygen and nitrogen species produced. Devolopment of cancer is related to progressive genetic instability which is one outcomes of chronic inflammation from any cause. 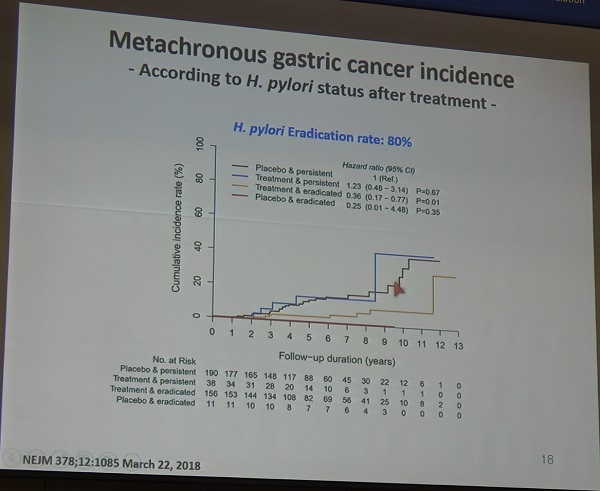 The H. pylori organism itself is also directly involved in carcinogenesis through its ability to induce breaks in double-strand DNA, cause abnormal DNA methylation, and alter expression of microRNAs. The infection also stimulates activation-induced cytidine deaminase which can alter nucleotides. As one might expect, infections with strains causing a greater inflammatory response, such as those with an intact Cag pathogenicity island, are more often associated with development of cancer. However, infections with strains lacking all known virulence factors develop cancer. 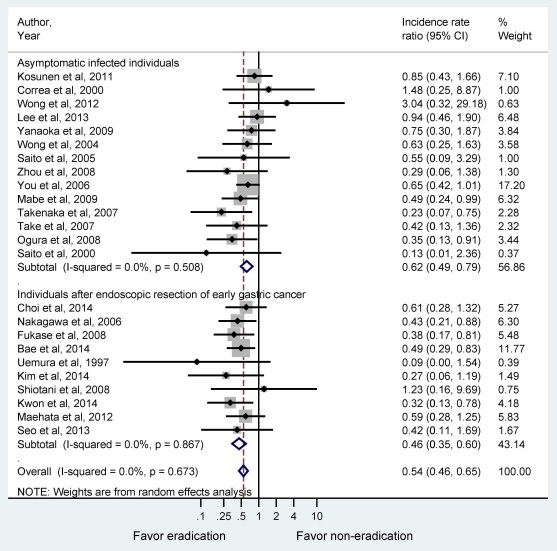 No proven cancer promoting bactrial factor has yet been discovered. Whether there is an important role of the infection in altering the local immune response to the cancer remains unknown but is suspected. 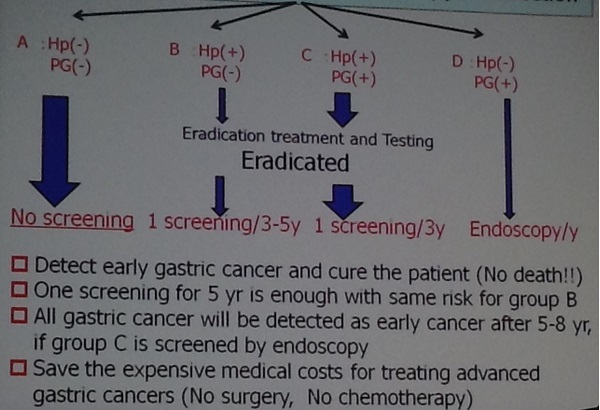 Cancer risk is related to the degree and reversibility of gastric mucosal damage. 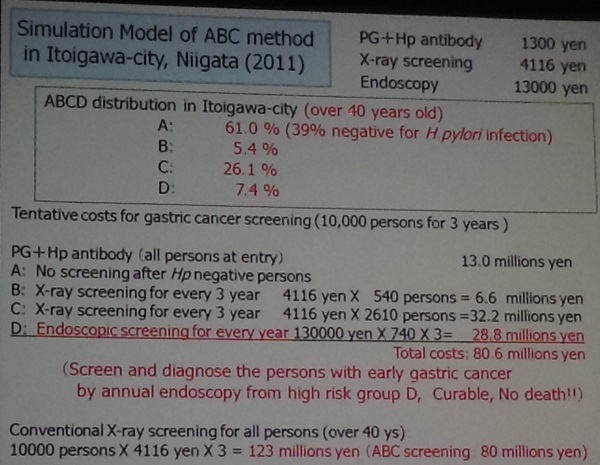 After atrophy has developed the patient will have an increased risk of gastric cancer despite H. pylori eradication. 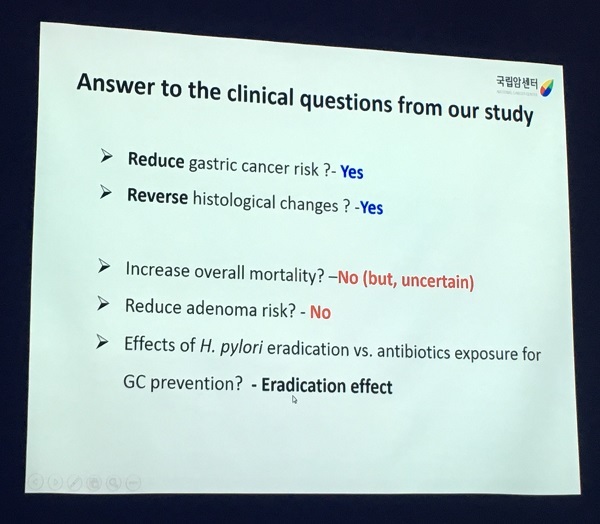 The degree of risk increases exponentially with time, however the process can be stopped and partially reversed by H. pylori eradication. 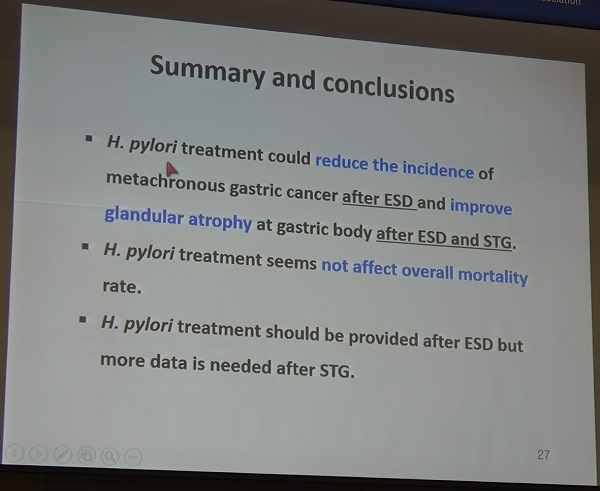 Gastric cancer can be largely eliminated by preventing H. pylori infection. 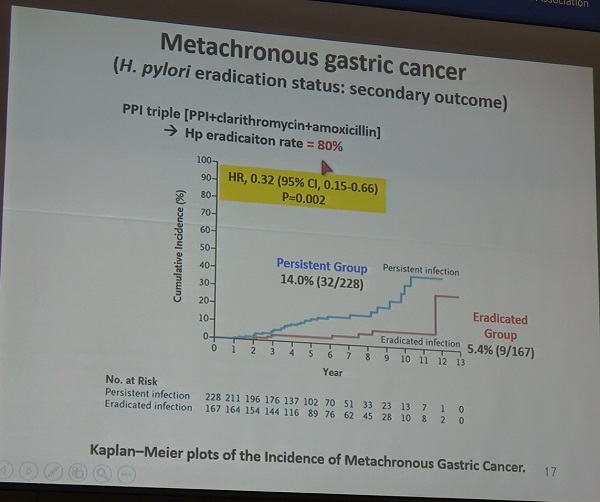 Among those with H. pylori infection, the risk of developing gastric cancer can be also markedly reduced by treatment especially before the development of atrophic gastritis. 헬리코박터가 위암의 원인인자라면서 그냥 두고 보자니 앞뒤가 맞지 않는다고 물어오는 분이 계십니다. 어떻게 설명하는게 좋을지 궁금합니다. 어떠한 것이 암의 원인으로 생각된다는 것과 꼭 치료해야 한다는 것은 전혀 다른 이야기입니다. 일단 헬리코박터가 위암의 원인인가요? 강력한 carcinogen 정도일 것입니다. 위축성 위염을 가진 환자에서 헬리코박터를 치료해서 위암이 예방된다는 증거가 있을까요? 직접적인 증거는 없습니다. 간접적인 suggestion 정도입니다. 비용과 부작용도 고려해야 합니다. 암의 예방을 위하여 헬리코박터를 치료하는 것은 아직 규정 밖입니다. 규정을 변경해야 한다는 의견은 많고 저도 조건부로 찬성입니다만... 아직은 규정 밖입니다. 그냥 단순하게 생각하는 것이 좋습니다. 규정을 지키는 쪽이 환자들의 혼선이 적습니다. 중국에서의 대규모 연구인데 negative data입니다. Subgroup analysis보다는 main research finding이 중요합니다. 결과는 negative였습니다. 제균해보았자 암 발생이 의미있게 줄어들지 않는다는 것이었습니다. 헬리코박터 제균치료가 위암 발생을 억제할 수 있다는 많은 근거가 모이고 있습니다. 대규모 intervention study의 positive data가 없을 뿐입니다. 이제는 결정해야 할 시점입니다. Best of best result를 기다릴 것인가, 아니면 best available data에 근거한 합리적인 판단을 할 것인가 결정해야 합니다. 저는 best available data에 근거하여 Hp 제균치료 적응증을 확대하는 것이 맞다고 생각합니다. 비록 심평원 기준은 아니더라도 환자에게 충분히 설명한 후 선택적으로 제균치료를 하는 것을 지지합니다. 위암 예방이라는 측면에서 젊은 사람에서 더 적극적으로 치료하는 것은 어떻게 생각하시는지요? 저는 젊은 사람에서는 우연히 발견되어도 하고 있습니다만. 위암 발생에서 point of return이라는 이론이 있는 걸로 알고 있습니다. 교수님께서는 어느 정도의 변화가 point of return이라고 생각하시는지요? 만약 헬리코박터 제균치료를 통하여 위암 발생을 줄이겠다고 한다면 젊은 나이가 유리합니다. 과거부터 40-50세 정도를 point of no return이라고 생각하여 그 이전에 시행해야 한다는 것이 일반적 견해였습니다. 최근 일본에서는 고등학생들을 검사하여 치료하는 것이 좋겠다는 의견이 많은 것으로 들었습니다. 한 사람의 위 안에도 여러개의 다른 point of no retrun을 지닌 위점막이 공존하므로, 고작 몇 개의 조직검사로 atrophy, intestinal metaplasia를 기준으로 헬리코박터 제균치료 시점을 정하는 것은 매우 위험합니다. 그리고 지난 일본 Hp학회에서는 고등학생도 이미 늦었을 수 있으니, 유치원생부터 치료해야 한다는 의견이 더 많았습니다. 얼마 전 종편의 건강프로그램에서 위내시경과 관련된 주제를 다루는데, 함기백 교수님께서 출연진들 내시경을 설명하시면서 위축성위염과 장상피화생에 대해서 제균치료를 해야한다고 하여 제 환자들이 제균치료를 하고 싶다고 내원한 환자들이 있었습니다. 방송에 그런 내용이 나올 정도면 이제 공식화 해서 제균치료 범위를 넓혀달라고 공론화하면 안되는 것인지 답답하여 메일 보내봅니다. 혹시 방송에서 그런 내용이 나왔을때는 어떻게 대처해야 하는지 알고 싶습니다. 헬리코박터학회에서 제균치료의 적응증 확대에 대한 의견을 여러번 낸 적이 있습니다. 당연히 적응증 확대입니다. 마지막 가이드라인은 2013년에 발표되었는데 막무가내입니다. 권고수준과 근거 수준이 ITP는 1A, functional dyspepsia는 2A인데 이것조차 받아들이지 않고 있는 상황입니다. Atrophic and metaplastic gastritis는 2C입니다. 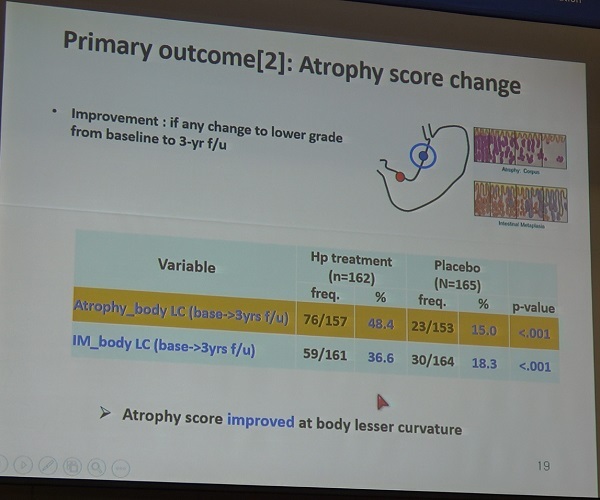 정부(심평원)에서 적응증을 넓혀주기 전까지는 atrophic/metaplastic gastritis에 대한 제균치료는 아직 불법입니다. 여러 교수님들이 자신의 의견을 언론에서 밝히는 것은 나쁜 일은 아닙니다. 적응증에 대한 기준을 너무 tight하게 운영하면서 off label 처방을 허용하지 않는 나쁜 제도가 문제입니다. 저는 과거에는 atrophic/metaplastic gastritis에서 절대로 처방하지 않았습니다. 환자가 강력히 요구하면 "저에게 불법진료를 강요하지 말아주세요. 혹시 원하시면 아는 의사 찾아가서 몰래 불법 처방 받으세요. 영 원하시면 국가기관에 민원을 내세요. "라고 답했습니다. 대한민국 국민은 아무리 마음에 들지 않더라도 대한민국의 법을 지켜야 한다는 입장이었던 것이지요. 수 년 전부터는 flexible하게 운영하고 있습니다. 저도 나이를 먹은 모양입니다. 국가 지침도 중요하지만 환자를 불쌍히 여겨야 한다는 생각을 하게 되었습니다. 잘못된 정책을 가진 국가의 국민이라고 무조건 잘못된 치료를 받게 방치해서는 안되니까요. 그렇다고 제가 계속 불법 진료를 할 수는 없는 일입니다. 그래서... 최소한 가장 중요한 부분, 그러니까 학회 가이드라인에서 권고수준이 1으로 나온 부분과 근거수준이 A인 부분은 환자에게 잘 설명한 후 급여으로 처방하고 있습니다. 일정 부분 삭감은 어쩔 수 없는 일입니다. 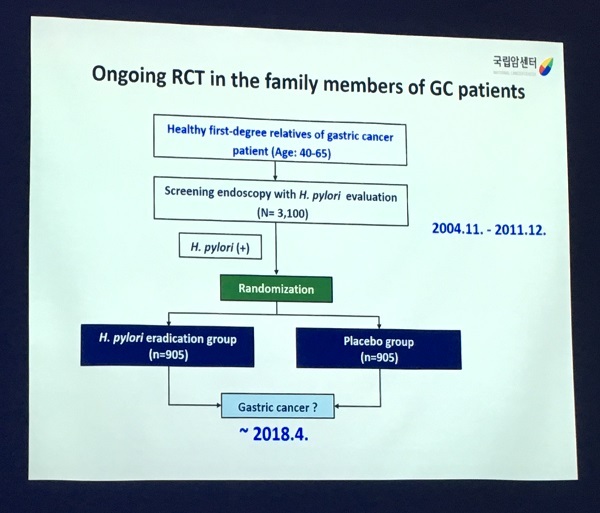 아직 atrophic/metaplastic gastritis 환자에 대하여 제가 먼저 제균치료를 권유하지는 않고 있습니다. 권고수준이 2이고 근거수준은 C 이기 때문입니다. (일본과 달리) 우리나라 전문가들은 아직까지 atrophic/metaplastic gastritis 환자의 제균치료를 강하게 권하지 않고 있다는 의미이니까요. 환자가 강력히 요구하면, 현 상황(불법임. 효과는 크지 않음. 의료진간 견해차가 있음. 우리나라를 빼고 일본이나 대부분의 국가에서는 제균치료를 하고 있음)을 설명한 후 강력히 원하면 끌려가듯이 마저 못해 처방하고 있습니다. 언제까지 이렇게 할 수 있을지 모르겠습니다. 삭감이 너무 많으면 예전처럼 '100% 법을 지킨다'로 돌아갈 수 밖에 없을지 모릅니다. 그런데 아직 삭감이 많은 것 같지는 않네요. 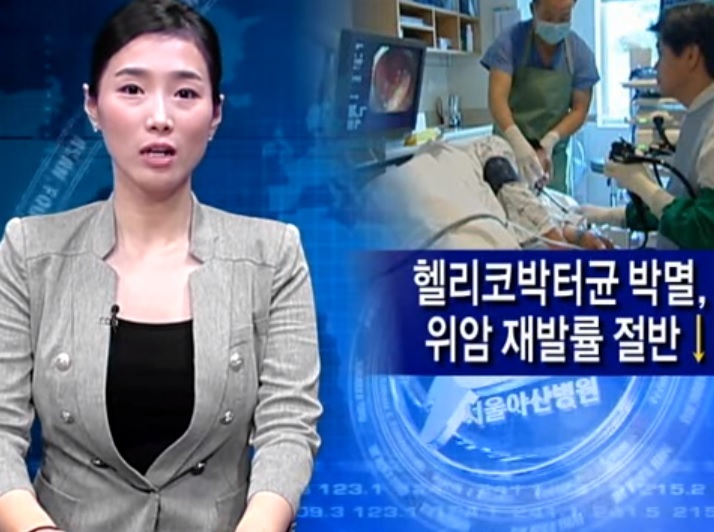 비급여 처방은 한번도 해본 적이 없습니다. 공론화 노력은 많이 진행되고 있습니다. 신문 방송에서도 계속 나오고 있습니다. 학회에서도 열심히 노력하고 있습니다. 정부에서도 잘 알고 있습니다. 그런데도 안 바꿔주네요... 이상한 일입니다. 대한민국 국민을 위한 일을 대한민국 정부에서 나몰라라 하고 있으니 저도 도리가 없습니다. 저도 조금씩 지쳐갑니다. 생각도 자꾸 바뀝니다. 보내주신 편지와 원고를 잘 보았습니다. "놀랍게도 일본에서는 소화기내과 의사가 아닌 검진전문가들까지도 "어떻게 하면 위암검진 위내시경 검사를 중단시킬 것인가? "를 주장하고 있다는 걸 이번에 처음 알았습니다. 2016년 2월 4일부터 국가검진에 위내시경 검사가 추가되는 바람에 더 많은 건강한 사람들(미감염자들)이 희생당하고 있으므로, 어떻게든 중단시켜야 한다는 주장이 대세였습니다. "라는 편지의 내용은 충격 그 자체입니다. 이미 알고 있는 내용이지만 들을 때마다 충격입니다. '위내시경 검진에 앞서 고려해야 할 사항들'이라는 제목의 원고를 흥미롭게 읽었습니다. 몇 가지 의견을 드립니다. "위암의 일차 예방책은 위내시경 검사가 아닌 제균 치료이다. "라는 소제목은 매우 중요한 선언입니다. 검진한다고 암이 줄어들지 않습니다. 오히려 암 환자는 많아집니다. 고령의 무증상 작은 위암도 마구 발견되고 있기 때문입니다. 헬리코박터 감염을 방치하는 현 정책은 반드시 바뀌어야 한다고 생각합니다. '100/100 선별급여'는 말이 되지 않습니다. 헬리코박터 감염증도 일반적인 경우와 동일한 방식("급여")으로 진단,치료되어야 합니다. "유독 우리나라에서만 전문가들조차 위암의 원인을 H. pylori 감염이 아닌 음식 탓으로 돌리는 경향이 있는데" 라는 부분은 매우 적절한 지적입니다. 헬리코박터 감염을 치료하지 않고 식생활만 주의하는 것은 그야말로 웃긴 일입니다. "H. pylori 감염은 주로 가족 간에 수직전염으로 이루어진다고 알려져 있었으나, 어른이 되어 처음 감염되는 수평전염도 드물지 않다. "는 지적도 매우 중요합니다. 술잔을 돌리는 것도 위험한 일입니다. 술잔을 돌리지 않도록 음주문화혁신이 필요합니다. 미감염자 보호 이슈는 우리나라에서 거의 다뤄지지 않고 있어서 걱정입니다. 앞으로 이 부분에 대한 심도있는 고민과 토론이 필요합니다. 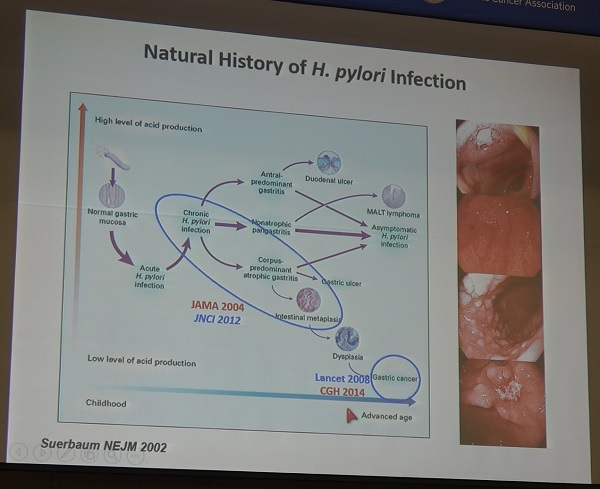 "위내시경 검진 시 H. pylori 감염 상태를 진단할 수 있어야 한다. "는 부분은 중요하고 시의적절합니다. 많은 국민들이 적절한 훈련을 받지 못한 의사에게 내시경 검사를 받고 있는 현 상황은 하루 빨리 개선되어야 합니다. 민영일 비에비스 나무병원장은 "헬리코박터균은 우리나라 성인의 약 60~70%가 감염돼 있고 이 균이 입으로 들어와 위 속에서 기생하고 있다"며 "성인의 경우 균을 없애면 1년 안에 재발할 가능성이 2~3%로 낮기 때문에 치료할 만하다"고 말한다. 그러나 민 원장은 "만성위염 치료를 위해서 헬리코박터를 치료할 수 있지만 이미 완전히 성립된 위축성 위염과 화생성 위염은 헬리코박터를 치료해도 정상으로 돌아가지 않기 때문에 내시경 검사를 1년에 한 번씩 하는 게 훨씬 중요하다"고 지적한다. 정훈용 서울아산병원 교수는 조기 위암으로 치료받은 환자 중에서 헬리코박터 제균 치료를 받은 환자가 제균 치료를 받지 않은 환자에 비해 위암 재발률이 13%에서 7%로 절반 가까이 줄어든다는 연구 결과를 최근 발표한 바 있다. 김재규 중앙대병원 소화기내과 교수는 "선진국에서는 만성위염이 있어도 헬리코박터균 치료를 처방해주지만 국내에선 의료보험 수가 때문에 위궤양이 심각한 환자들을 중심으로 처방한다"며 "위암 발병을 미리 예방한다는 차원에서 의료보험 수가 적용을 탄력적으로 운용할 만하다"고 설명했다. 전문가들은 헬리코박터균이 위궤양이나 위염을 일으키는 원인이지만 모든 보균자에게서 발병되는 것은 아니라고 말한다. 또 헬리코박터균이 위암 유발 인자로 간주되고 있지만 헬리코박터균을 없애면 위암 발생률이 낮아진다는 명확한 근거도 없다고 주장한다. 미국 국립보건원은 △궤양이 있으면 헬리코박터균을 반드시 제균 치료 한다 △위염환자에게 발견된 헬리코박터균은 치료할 필요가 없다 △위암과 헬리코박터균의 상관관계는 분명하지 않다는 절충안을 내놓은 바 있다. 김철중 기사님께서 옳은 이야기 하셨습니다. 헬리코박터는 제균하는 것이 맞습니다. 반면 위암을 어떨까. 위암도 발생률이 감소하고 있다. 하지만 그 속도가 더디다. 과잉진단 여지가 있는 갑상선암을 빼고 수십년간 한국인 암 발생 1위다. 위 내시경의 활성화로 초기 위암 상태로 발견되는 비율이 70% 정도다. 그 덕에 생존율은 10년 전 57.7%에서 74.4%로 크게 올랐다. 발생률이 눈에 띄게 떨어지려면 위암 발생 위험 요인인 짜고, 절이고, 삭힌 음식 섭취를 줄여야 한다. 식습관과 관련된 것이기에 그 변화는 천천히 이뤄지기 마련이다. 일본은 2001년부터 위암 사망자 수가 눈에 띄게 줄어들었다. 그 배경에는 위암 발생 요인인 헬리코박터 파일로리 감염 항생제 치료를 의료보험에서 지원했기 때문이다. 증상에 상관없이 감염이 확인되면 저렴하게 치료 받도록 했다. 참고로 우리나라는 위궤양이 있어야 건강보험이 적요오딘다. 일본은 그 정책으로 2014년 한해 위암으로 인한 사망자 수를 1만6000여명을 줄인 것으로 추산된다. 항생제 치료 비용을 치르고도 몇 배의 의료보험 재정을 아꼈다는 평가다. 의료 정책이 암 발생을 줄이는 분야가 어디 한두 개 이겠는가. 자궁경부암 백신 접종, 금연 치료 지원 사업 등도 여기에 해당한다. 갈수록 고령사회다. 암 발생은 계속 늘 태세다. 국민 3~4명 중에 한 명이 암으로 사망하고, 두 집안마다 암 경험자가 있는 상황이다. 암 진단과 발생 억제 의료에 충분한 수가 보상을 해주고 건강보험을 쏟아 부어야 한다. 그래야 국가 의료비는 줄이고, 국민은 건강하게 오래산다.